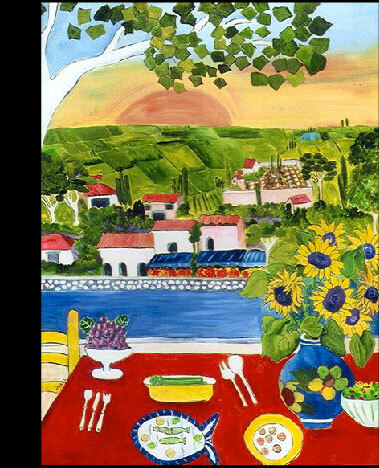 For nearly a quarter of a century, Nancy Parke has been a respected California artist who paints in watercolors, acrylics and oils. Her naive style of painting often focuses on pastoral scenes which create a gentle and inviting atmosphere. Her work is characterized by warm, rich and contrasting colors. Nancy has exhibited her paintings in a number of galleries, juried art shows and private salon showings in California, Arizona and Oregon. Her works are displayed by patrons in London, Bangkok, Bloomfield Hills, Laguna Beach, Malibu and a number of other locations. Nancy has also illustrated a children's book called "Otto, the Octopus." Nancy maintains her studio in Carlsbad, CA. For enlarged sample photos, catalogs or private showings, please contact Nancy. Copyright 2012-2018 © Nancy Waite Parke all rights reserved.